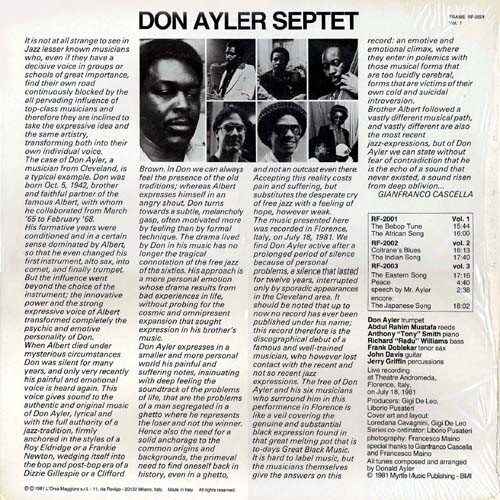 Don Ayler’s discography as leader (rather than sideman in his brother’s bands) is limited to two revelatory tracks from a 1969 New York concert, included in Revenant’s Holy Ghost box set, an unreleased session for Amiri Baraka’s Jihad label, and the following triple LP set, recorded live at a concert in Florence, Italy in 1981. 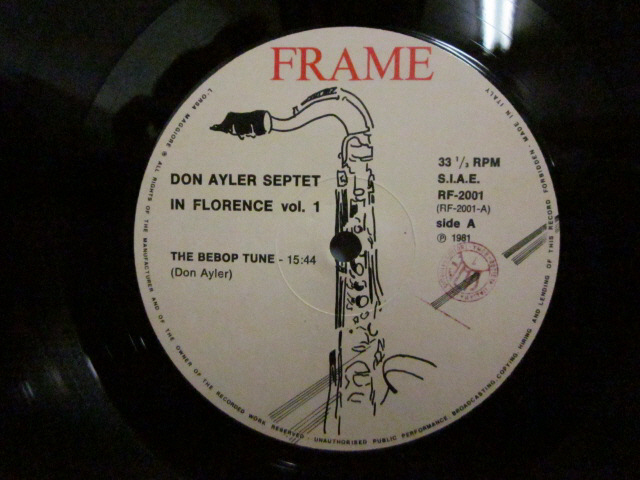 Released as Don Ayler In Florence 1981 Vol. 1, Frame (Italy) RF-2001. Vol. 2, Frame RF-2002. “It is not at all strange to see in Jazz lesser known musicians who, even if they have a decisive voice in groups or schools of great importance, find their own road continuously blocked by the all pervading influence of top-class musicians and therefore they are inclined to take the expressive idea and the same artistry, transforming both into their own individual voice. The case of Don Ayler, a musician from Cleveland, is a typical example. Don was born Oct. 5, 1942, brother and faithful partner of the famous Albert, with whom he collaborated from March '65 to February '68. His formative years were conditioned and in a certain sense dominated by Albert, so that he even changed his first instrument, alto sax, into cornet, and finally trumpet. But the influence went beyond the choice of the instrument; the innovative power and the strong expressive voice of Albert transformed completely the psychic and emotive personality of Don. When Albert died under mysterious circumstances Don was silent for many years, and only very recently his painful and emotional voice is heard again. This voice gives sound to the authentic and original music of Don Ayler, lyrical and with the full authority of a jazz-tradition, firmly anchored in the styles of a Roy Eldridge or a Frankie Newton, wedging itself into the bop and post-bop era of a Dizzie Gillespie or a Clifford Brown. In Don we can always feel the presence of the old traditions; whereas Albert expresses himself in an angry shout, Don turns towards a subtle, melancholy gasp, often motivated more by feeling than by formal technique. The drama lived by Don in his music has no longer the tragical connotation of the free jazz of the sixties. His approach is a more personal emotion whose drama results from bad experiences in life, without probing for the cosmic and omnipresent expansion that sought expression in his brother's music. Don Ayler expresses in a smaller and more personal world his painful and suffering notes, insinuating with deep feeling the soundtrack of the problems of life, that are the problems of a man segregated in a ghetto where he represents the loser and not the winner. Hence also the need for a solid anchorage to the common origins and backgrounds, the primeval need to find oneself back in history, even in a ghetto, and not an outcast even there. Accepting this reality costs pain and suffering, but substitutes the desperate cry of free jazz with a feeling of hope, however weak. The music presented here was recorded in Florence, Italy, on July 18, 1981. We find Don Ayler active after a prolonged period of silence because of personal problems, a silence that lasted for twelve years, interrupted only by sporadic appearances in the Cleveland area. It should be noted that up to now no record has ever been published under his name; this record therefore is the discographical debut of a famous and well-trained musician, who however lost contact with the recent and not so recent jazz expressions. 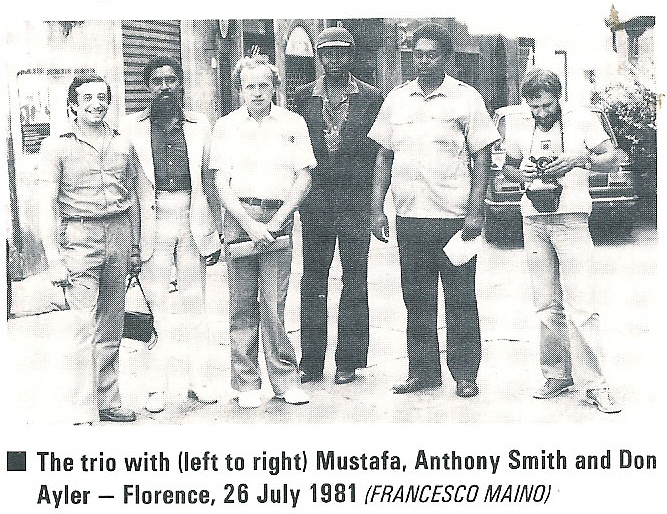 The free of Don Ayler and his six musicians who surround him in this performance in Florence is like a veil covering the genuine and substantial black expression found in that great melting pot that is to-days Great Black Music. It is hard to label music, but the musicians themselves give the answers on this record: an emotive and emotional climax, where they enter in polemics with those musical forms that are too lucidly cerebral, forms that are victims of their own cold and suicidal introversion. DONALD AYLER: Interview taken by Gianfranco CASCELLA. Transcribed by Francesco MAINO. Florence, Italy, July 24, 1981. CASCELLA: We know about your life in the period when you played with your brother Albert, from 1965 to 1968, a span of four years. How was your life before then, and how has it been since then? AYLER: My father and my brother used to play in the church. My father played the violin and the tenor sax, professionally, and my brother played the alto. We would go to church: my father would have us dressed up every Sunday to go to church and to Sunday school, and after I would go to the theatre, to the show, moving picture, but we would be in church most of time. Back when I was about sixteen I started out on the alto, then, my brother was playing the alto, and my father said that's enough alto in the house, so I picked up the trumpet: I had a natural ability to learn it, I had a natural ability on the trumpet, so next thing I know I was playing the trumpet and I practiced for three months, nine hours a day. C.: When did you begin playing professionally? C.: Was your brother together with you and John Coltrane? A.: Oh, we played the thing... February 1966. We played "MY FAVOURITE THINGS", we all played, you know, they booed us because they were not ready for the music at that time, they booed us, you know. This was recorded in Czekoslovakia, yeah, yeah, then from that period on, 1967, we did another recording, I'm not sure if it is 1968, it is 1968, the name of the record was "LOVE CRY", yeah, we played "LOVE CRY". C.: Did you compose or arrange any tune for "LOVE CRY"? C.: Did you compose or arrange any other tune? Possibly "JESUS". A.: No, my tune was "OUR PRAYER", that was my recording, my composition too. "LOVE CRY" is all by Albert. During a period when I came back from Europe in 1964 I came over the ideas of "OUR PRAYER", that was first, and then "THE TRUTH IS MARCHING IN" came later. They wrote in the album that "THE TRUTH IS MARCHING IN" was first, but "OUR PRAYER" was first. C.: How do you feel about the mysticism of your brother? About his interest in God, in the church, in the spirit? Do you agree with his ideas? C.: You were with your brother at the funeral of John Coltrane. What do you remember about that? How many people were there, thousands of people? Black, white? A.: At the funeral I was present, right, everyone was there, yes, I mean, not only musicians, but people from all lots of life, all colors from all nations, because people understood what John Coltrane stood for. I remember seeing Stockeley Carmichael, Rapp Brown... Yes, I remember, my brother and Ornette Coleman were supposed to play, and we played at funeral in St. Peter's Church. I think that everybody cried when they heard that he had died, you know, and I cried when I heard about it, I cried when I heard that he had died, but after a while I realized you couldn't bring him back in the world, so, you know, I just played the best I could, I think I played some of the best music of my life at old John's funeral, yeah, the music was recorded, we heard it, very spiritual music, very spiritual. C.: There are so many different versions about the terrible death of your brother. Can you tell us something about it? How did you learn that your brother was dead? A.: I was not in New York at the time, I was in Cleveland. We found out about it in Cleveland. They said that they had his body in the morgue, so my father, my mother and me, we went up there and we claimed the body. C.: But what did the police have to say about it? C.: After the death of your brother you seem to have stopped playing for about ten years. What was your experience of the music since then? C.: Who is Al Rollins, a relative of Sonny Rollins? C.: Where was that, just around Cleveland, or elsewhere in the States, New York, California? C.: Are you happy with your present group? C.: Of the tunes you play, which is the one you prefer?A. : I like "CHANGES COME", where I go up on the trumpet, real high, yeah. C.: Do you feel you are still in the jazz scene? Do people remember your name, ask you for interviews and the like? A.: Oh, I made one interview with, the one that, what's his name, let's see, what is the name of that... CADENCE, yes, it is Bob Rusch, yeah. C.: What are your plans for the future? A.: I hope to come back in the Fall of the year and travel all around Europe, and do festivals, club dates and everything. I Plan to go to Paris, Stockholm, Germany, Finland, Copenhagen, Denmark, and, let me see, maybe England. Don Ayler with members of his 1981 band and the Ganelin Trio. Holy Ghost also issued on Re-evaluation: The Impulse Years Impulse (US) AS-9257-2, Energy Essentials Impulse (US) ASD9228, La Saga Heroique d'Albert Ayler Impulse AS-1024, Pathe (France) 2C.154-92336/7 and Live In Greenwich Village: The Complete Impulse Recordings Impulse (US) IMPD 2-273 (according to the sleevenotes of which, the unreleased track, Saints, is believed lost). Also issued on CD coupled with Prophecy on ESP/ZYX (Germany)1010-2, Get Back (Italy) GET 1003CD and ESP- Disk’ (US) ESP 4006. Base (Italy) 3031 also released on DIW (Japan) 1001, and as Truth is Marching In on Magic Music (Germany) LP10003, CD30003. Base (Italy) 3032 also released on DIW (Japan) 1002, and as Black Revolt on Magic Music (Germany) LP10004, CD30004. Both original volumes released as In Memory of Albert Ayler, Jazz Door 1203, and as Complete Live At Slug’s Saloon, Lonehill Jazz (Spain) LHJ 10101. ESP-DISK (Japan) TKCZ-79158 (both volumes plus additional track) also released as Slugs Saloon on Get Back (Italy) GET 1018CD, GET 1018LP, Fruit Tree 841 and ESP 4025. All tracks released on Albert Ayler Live In Europe 1964-1966 Landscape (France) LS2-902, Landscape 902 (CD), Holy Ghost Revenant Records RVN 213 and Stockholm, Berlin 1966 HAT HUT Records hatOLOGY 717. A six-minute video of ‘Infinite Spirit’ from this concert (possibly from a TV broadcast of 28/11/66) is in circulation among private collectors. The programme was never broadcast and the tapes were later wiped. Filmed for the Public Broadcast Laboratory TV programme, which was broadcast on April 21, 1968 as “Who’s Afraid of the Avant-Garde?”. The Ayler footage was not included. Donald Ayler (t), Noah Howard (as) Don Pullen (p) Reggie Workman Norris Jones (Sirone) (b) Muhammad Ali (d). Recording session for Amiri Baraka’s Jihad label. Main Classroom Auditorium, Cleveland State University, Cleveland. May 3, 1981 (public performance recording). 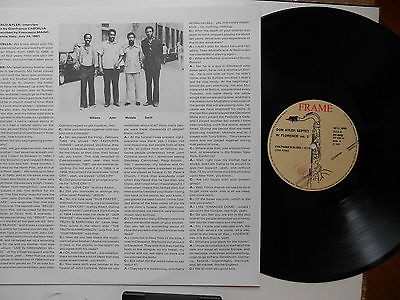 Don Ayler, Howie Smith (conductors), Frank Doblekar (ts) others unknown. Theatre Andromeda, Florence, Italy, July 18, 1981 (public performance recording).